The Indian Department of Science & Technology (DST) commissioned Elsevier to assess the performance of India’s research base compared with the world, the G8 and ten research-intensive countries (Australia, Canada, France, Germany, Italy, Japan, Spain, Sweden, the UK, and the US), BRICS and three other fast growing nations (Brazil, Korea, and Singapore), and the SAARC regional group of countries. This report tracks performance of the national research system in an international setting, combining a variety of indicators to present a multifaceted view of India’s comparative performance in research as well as the trends that may affect its future position. 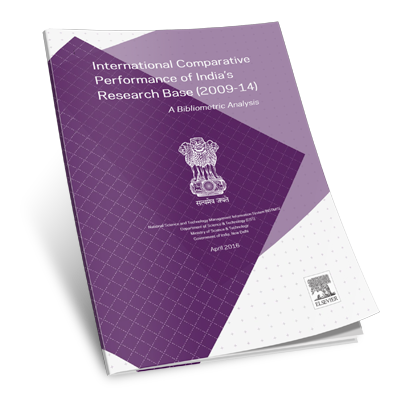 The International Comparative Performance of India’s Research Base – 2009-2013 report is the second consecutive report in this series to be delivered by Elsevier. The report shows that, "although India is still a relatively small player on the global stage, its wide-ranging international collaboration network and increasing shares of the world’s main research performance indicators reflect its overall growth in output, impact, and knowledge transfer" and advises that, "improving India’s international and cross-sector collaborations could be key to further growing the impact and visibility of India’s research." India's research performance has improved from 2009 to 2013. In 2009, India produced more publications than Spain, Australia, Korea, Brazil, Sweden and Singapore. In 2013, India's output rose to also surpass that of Canada and Italy. Along multiple indicators of research, India has small but growing shares of the world's total, as shown in Figure A. Figure A - Macro snapshot of India's research performance, 2009-2013. Source: Scopus database. Increasing Output. India's share of the world's S&T shcolarly output has grown from 3.1% in 2009 to 4.4% in 2013. In absolute terms, this 1.3 percentage points increase corresponds to a high compound annual growth rate (CAGR, see Appendix J for definition) of 13.9%, from 62,955 papers in 2009 to 106,065 papers in 2013. The world CAGR is 4.1% over that period. India's share of the world output of international collaboration publications has increased from 3.3% in 2009 to 3.9% in 2013. Growing Impact. India's shares of the world's citations and of top cited papers (25%, 10%, 5% and 1%) all have increased between 0.8 and 1.2 percentage points from 2009 to 2013, demonstrating that India has not only grown in output but also in impact, especially in the highest excellence percentile. Improving Knowledge Transfer. India's share of the world's patent citations has increased by 0.7 percentage points, from 2.2% in 2009 to 2.9% in 2013. Its share of the world's academic-corporate collaborated papers has grown by half a percentage point, from 1.7% to 2.2% in 2013. In absolute terms, this corresponds to 7.0% CAGR from 953 papers in 2009 to 1,250 papers in 2013. Figure B shows that India's international collaboration network spans the whole globe, comprising several prolific partners (e.g., the USA, Germany) or impactful partnerships (e.g. with Mexico, Georgia, Sri Lanka, Armenia, Belarus). Figure B - India's international collaboration network 2010-2014. See Table H.2 in Appendix H for country abbreviations. The size of the nodes is proportional to the number of papers published by each country; the colour of the nodes reflects the FWCI of each country's papers: the size of the edges indicates Salton's Index; the colour of the edges represents the FWCI of India's papers collaborated with each country. Each node in Figure B is coloured based on the country's field-weighted ciration impact (FWCI) wherein the count of their received citations per field and year have been normalised to the world average. An FWCI greater than 1.00 indicates the research is of higher quality than the world average. The edges of lines between the nodes indicate the quality of the research conducted by the two partners, and in all cases the quality is higher than the world average. In 2013, 17,006 papers representing 16.0% of India's S&T scholarly output were the product of international collaboration and these papers were cited 39% more than the world average across collaboration types. However, the proportion of India's output resulting from international collaboration has decreased between 2009 and 2013 by 1.3 percentage points. Although India is still a relatively small player on the global scientific stage, its wide ranging international collaboration network and increasing shares of the world's main research performance indicators reflect its overall growth in output, impact, and knowledge transfer. Improving India's international and cross-sector collaborations could be key to further growing the impact and visibility of India's research on the global scientific scene.